The Maryland Transportation Authority will be holding two public meetings to provide information on the upcoming Interstate 95 Express Toll Lanes northbound extension project. No formal presentation will be given, and the same information will be provided at each meeting. Local residents are invited to attend either meeting. improvements along I-95, learn about Bradshaw and Old Joppa road’s overpass & detour routes, learn about noise wall locations, and share ideas & ask questions. 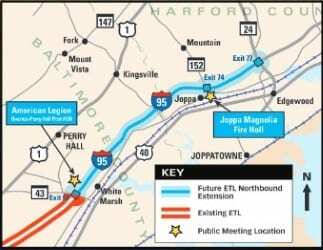 The $210 million project to extend the northbound I-95 Express Toll Lanes (ETL) for 7.75 miles from north of MD 43 in Baltimore County to MD 24 in Harford County was first announced back in December. For more information on these meetings, visit the MDTA by clicking here.